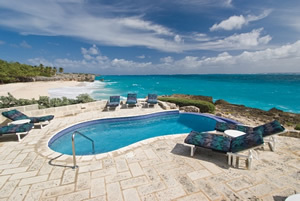 Set on a promontory overlooking the southeastern coast of Barbados, Coral Point affords its guests complete seclusion. Immediately below, the Atlantic Ocean rolls in against the rocks with a steady, tranquilizing sound. To the west, steps cut into the coral lead down to a sheltered, palm-shaded beach. Guests who prefer the convenience of a swimming pool, or who like to take a fresh-water dip after a swim in the sea, will appreciate the fact that this villa has its own pool set on the cliff front with a dramatic view of the beach and ocean. In addition the complex has a shared pool which is the central feature of the artfully-landscaped garden-court that is shared by three luxury villas on the point. The villa has four air conditioned bedrooms. Three of the bedrooms have ensuite bathrooms while the fourth is located across the hall. The vaulted, double-height living/dining space is stained white, decorated with elegantly casual furniture, and the expanse of French doors enables this room to be entirely open to the views of the ocean. The villa also includes a well-equipped kitchen, washer and dryer. There is a large patio for sunbathing as well as a covered patio for those wanting to avoid the sun while still being able to be in close contact with the "sun-worshippers". These patios are perfect for reading during the day, cocktails at sunset, or alfresco dining at any hour. Daily housekeeping service is provided, and on request, arrangements can be made to have a cook. 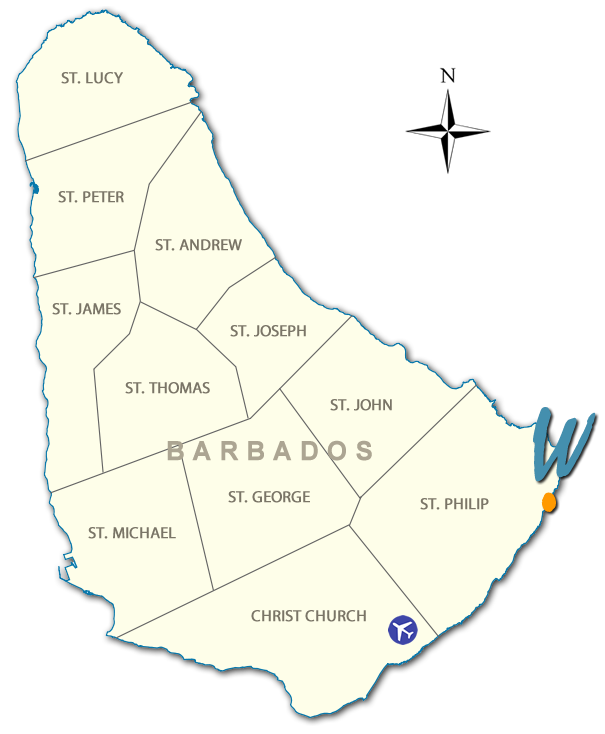 There are many beautiful islands in the Caribbean but, as so many travelers have already discovered, Barbados is a special experience. No other destination can offer the same combination of pristine white sand beaches, fine cuisine, a rich cultural history, exciting nightlife and the ability to enjoy it all freely — without being confined by the boundaries of a resort. "This was our seventh visit to this beautiful location...sunshine, blue skies, 80 degrees and soft ocean breezes. We look forward to returning in 2013"
"The house is magnificent. This was our first trip to Barbados and couldn't have picked a better place to have stayed." "The weather, the staff and the house, all spectacular, noteworthy and special." "W" marks the spot where a true treasure of island living awaits you!